A new version can be found on the update site. The new versions of the features contain the latest fixes. 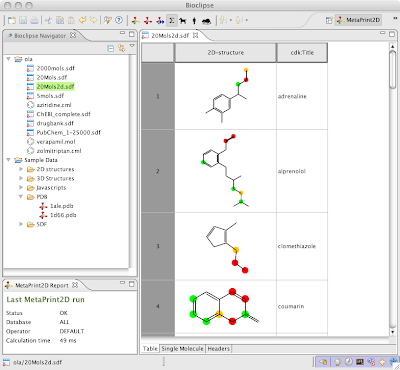 New in this version is support for Jasper reports which are so far used by Bioclipse Decision Support and Bioclipse Brunn for generating printable reports. To update go to Help -> Software Updates... and select the features you want to install. And of course bug fixes and probably a lot of other stuff which I don't know about. If you download and try the release candidate of course you already know that we love to get bug reports in our Bugzilla. 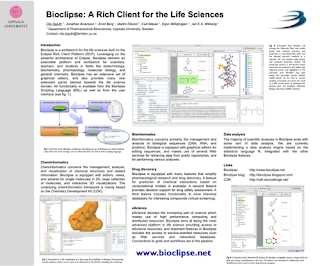 Bioclipse is one of three Finalists for the Eclipse Community Awards 2010 in the category Best RCP Application. I am looking forward to going to EclipseCon, it will be my first visit. I have also submitted a poster, and hope it will be among the selected ones (see below or the submission abstract). UPDATED: My poster is now accepted!